The official hurricane season along the Atlantic seaboard extends from June 1 through November 30. Typically, the chance for damaging storms peaks in August and September in the Carolina Lowcountry. Large shade trees, like Live Oaks and Laurel Oaks, are able to better withstand the winds that accompany these storms if they have been maintained properly. Plant trees that are well-suited to coastal areas. Trees with dense wood, such as Live Oaks, are better-suited to the Lowcountry because they can withstand high-wind storms. Fast-growing trees like Pines, Sycamores and Sweetgums have weaker wood and often lose limbs or fall over in stormy weather. When in doubt of whether a tree is a good choice for your landscape, select a native tree like Southern Magnolia, Redcedar, Live Oak or Palmetto. These trees are well-adapted to the conditions of our coastal landscape and are more likely to survive seasonal storms. Thin the branches in mature trees to allow wind movement through canopies. A tree with a very thick canopy often does not fare well in a storm. As the wind blows, it is held by the canopy like a sail. This, coupled with the added weight of a water-soaked leaves and Spanish Moss, causes heavy branches to break. A trained arborist can selectively remove crossing branches, decayed limbs, and other interior foliage to allow wind to move safely through the canopy. Take care not to injure the branch collar when removing limbs. If the branch collar is damaged, the tree will not be able to seal over the pruning wound and it will be susceptible to decay. Never remove the top from a tree. Trees are often “topped” to reduce the overall height of a large tree so that it will fit under power lines or to improve a view from vantage point. When trees are over-pruned in this manner, the interior of the tree trunk will quickly decay. Branches that are attached to a rotten trunk will easily rip from the trunk during a storm. If a tree needs to have its height reduced, it is important to remove individual branches back to a branch crotch or remove the tree entirely. A certified arborist is equipped and trained to properly prune large trees. Remove branches with tight crotch angles. If a branch or limb is attached to a tree at an angle that is 45 degrees or less, it is more likely to rip than a branch that is attached at a 90 degree angle. Bradford Pear trees have tight crotch angles in the canopies and are notorious for “falling apart” during ice storms and hurricanes (image, right). Prevent tree damage by removing branches with tight crotch angles. It is easier to correct these problems if the limbs with poor structure are removed when they are young. Protect the roots. The roots of a tree often extend well beyond the “drip line” of the canopy. Root damage can occur from compaction, construction, over-mulching and improper use of herbicides. Roots have two main functions: absorbing water and minerals from the soil and anchoring the tree. If roots are damaged, the tree will be more likely to fall over during a tropical storm. 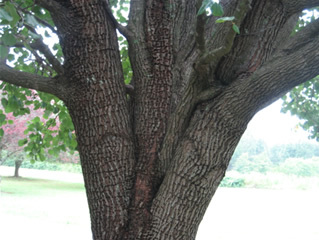 Inspect the trunks of your trees to make sure that mulch kept away from the bases. Look to see that there is a visible “root flare” where the trunk meets the soil. If the tree grows straight into the soil like a telephone pole, it is too deep and is more susceptible to storm damage. If you are concerned about how your trees will fare in a tropical storm, consult with an arborist. Arborists are trained to identify trees that are potential hazards to your home. Though a consultation, arborist can advise if any trees need to be removed completely and which trees would benefit from selective pruning. Preventative maintenance of landscape trees will help to avoid tree and property damage during hurricane season.